The Fuse Alumni Tour continues in 2018! We’re visiting Cohort 1 and Cohort 2 alumni around the state to catch up with them in their current roles and spotlight their work. Follow the hashtag #FuseRIAlumniTour for more updates. Tracey Kareemo teaches Grades 4 at Nathanael Greene Elementary School in Pawtucket, RI. Follow her on Twitter @tkareemo and check out her Fuse Fellow profile for more information. Cohort 1 Fuse Fellow Tracey Kareemo assists a student in her classroom during my visit on January 19, 2018. I was excited to kick off the first leg of the Fuse RI Alumni Tour 2018 edition with a visit to Tracey Kareemo’s classroom. I’ve known Tracey since 2015 when I first joined the Highlander Institute team, but had never had the pleasure of seeing her in action with her students. I quickly forgot the January chill as she introduced me to the class and invited me to jump right in. I started by chatting with Tracey’s student teacher this year, Michelle Carvajal. Michelle attends Rhode Island College and was previously a long term substitute at Nathanael Greene, working down the hall from Tracey. The two quickly connected over a shared interest in building student autonomy and using small groups to promote deeper conversation with kids. 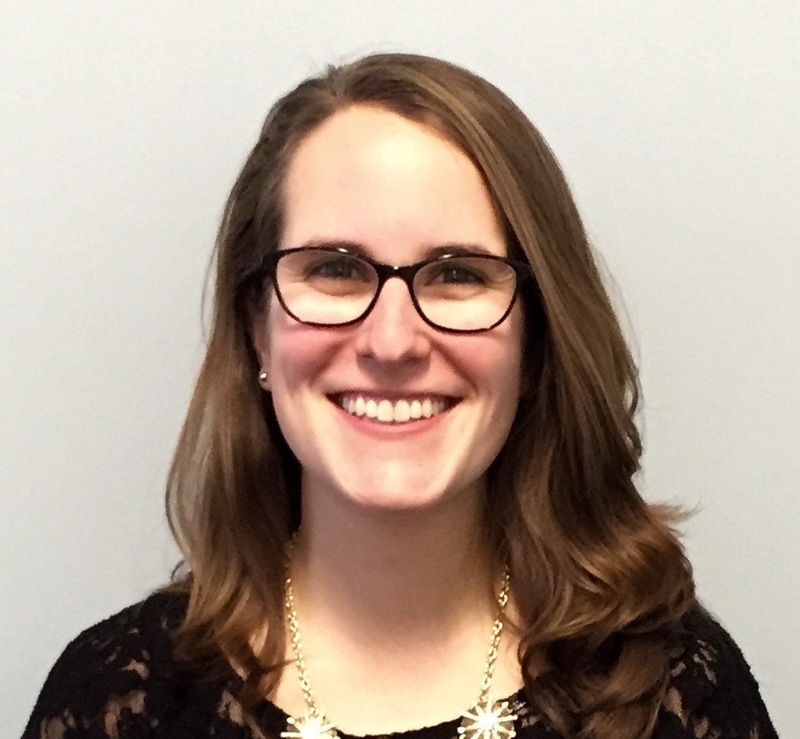 Michelle noted that movement in the classroom is important, so that students remain engaged, and that the programs in use in the classroom have helped her target specific standards and skills to work on with different students. 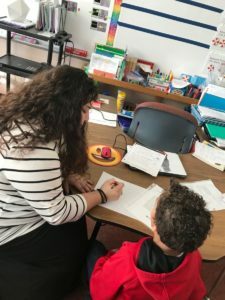 Tracey’s student teacher, Michelle Carvajal, works with a student one-on-one. The structures that Tracey has put in place with her students allow them to have the ability to move through tasks within a certain timeframe, with limited anxiety or pressure stemming from the pace of the rest of the class. When I visited, students were working through a mix of content, submitting answers to a weekly math assessment on GoFormative before completing a paragraph to address a culminating ELA comprehension question. Tracey has found that students respond well to the feedback features of many edtech tools. For example, she frequently comments on students’ Google Classroom submissions, and they are expected to reflect, revise, and resubmit when ready. 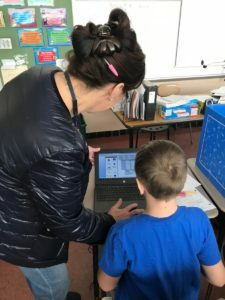 This is Tracey’s first year using the GoFormative platform, which has been a success. She’s using assessments that spiral the Common Core standards. For her, it solidified that student growth should be measured through metrics that give a better sense of the full story and not a one time scenario, like “I took my test on this one standard/skill and got a 100% so I’m all set!” In practice, this means that Tracey is seeing student progress over time and not as a single data point. Students also seemed to be active participants in this conversation, sharing some specific math and coding skills they had mastered, and which ones still required revisiting. Tracey wants to push on this, and is inspired to find out new ways to show students what they are really learning and growing on. 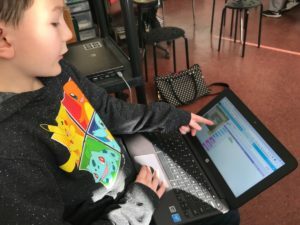 A student shares his progress on Code.org and describes his attempt to program a character on the screen to navigate a maze. 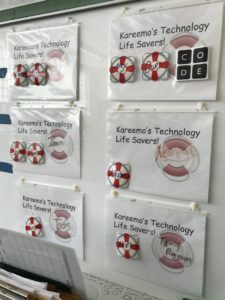 The classroom’s side board displays “Technology Lifesavers,” student techsperts with specific support roles.